Just in time for the Super Bowl, I have another instructing article for you. I wrote this one earlier in the year, thinking that I might use it for my National Team application, but it ended up being too long, and I don't feel like it really dove into the technical details enough. I explained the things that you should do, but I didn't explain "how?" or "why? ", and those things are pretty crucial to ski instruction. But I feel as though it works pretty well in this space. Enjoy! Before the ski season starts, I watch a lot of football games, and I watch a lot of football analysis. One of the favorite topics is “footwork”. They’ll talk about whether a quarterback is using a three step drop or a five step drop and what each movement entails. They’ll argue over an offensive lineman’s starting position, and whether it will allow him to move his feet to block that defensive end. Footwork, it seems, is very important in the NFL. In skiing, footwork separates telemark skiers from the rest of the people at the mountain. While alpine skiers have limits in the fore/aft direction and snowboarders are locked into a constant stance width, tele skiers have more freedom to put their feet wherever they want as they slide down the hill. But great freedom comes with great responsibility. If tele skiers aren’t practiced, positive, and precise in their footwork, the risk of calamity and catastrophe grows. Practice is essential, in both skiing and football. By the time they reach the pros, quarterbacks have been doing 3 step drops for years, and know exactly how long the first step should be, how far the second step crosses over the rear leg, and where the last step has to be so that they can plant their foot and make a powerful throw. These ingrained movements take a long time to learn, and every time a quarterback moves his feet and legs in that specific way, he learns a little bit more, either consciously or subconsciously. We do the same thing in telemark skiing. With every turn, our bodies relay little notes to our brain: “That worked.” “That didn’t work.” “What are you trying to do now?” “Ouch.” The trick to filling your brain with useful notes is to make both great turns and bad turns. Make turns with a wider than normal stance, or with more fore/aft separation between your feet. Notice any footwork changes in variable snow conditions. What works best when you’re on something steep? Think about the duration, rate, and timing of your footwork, and how that affects the turn. With practice comes positivity. If your brain absorbed all (or most) of the messages the body sent it, you start to develop a little confidence in where you place your feet. You know what works, and you can repeat those moves on demand. Now you can start to change little things in the footwork that will add to performance. You might find that tipping the new trailing foot when you pull it back aids in the development of your edging skills. You might realize that subtle moves in your feet and ankles allow you to adjust your balance in new and interesting ways. 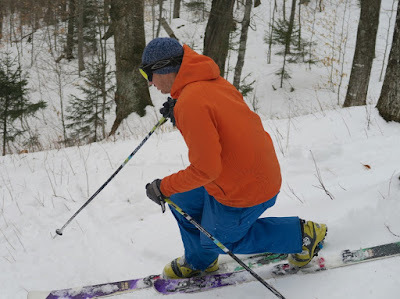 You might discover that sometimes, the best footwork is to leave your feet exactly where they are and do 3 monomark turns in a tight spot between trees. Like the NFL, other parts of the game open up to you when you gain confidence in the basics. As you develop your telemark skills, the final hurdle to great skiing is precision. Plenty of quarterbacks never achieve greatness because they just aren’t precise enough. It’s similar with skiing, where a small change in edge angle, foot placement, or ankle flexion can make a big difference in a turn. In skiing, precision is the hardest thing to achieve, and even if you have it in one turn, it might be gone in the next. Adjustment and adaptability are important in both skiing and football. Even the best pros make mistakes sometimes. And not every turn will be perfect. But if your footwork movements are developed with practice, enhanced with positivity, and refined with precision, it will allow you to make the next turn better than the one you just made. And that sounds like a solid goal for everyone. Great post…sounds like golf, you have it in one turn (hole), gone in the next. People in golf say he has great hands, never really understood what that meant, maybe the same thing as great feet in skiers and quarterbacks.